NAB 2017: Google and YI Technology unveil YI HALO, a next-gen virtual reality (VR) camera built with Google's Jump technology. YI Technology today unveiled YI HALO, a next generation virtual reality (VR) camera built with Google's Jump technology. YI HALO meets even professional VR creators' and filmmakers' most challenging demands. By combining the most advanced capture technology and stitching with ease and versatility, creators can see everything, go anywhere, and create vibrant, immersive VR stories and experiences with confidence. YI HALO is the highest fidelity 360-degree capture solution for maximum stereo effect, fidelity and immersion. It consists of 17 camera units including the Jump platform's only up-view camera unit, allowing users to experience a scene in every direction without missing a thing. Built by the same engineers who created the acclaimed YI 4K and 4K+ action cameras, the YI HALO's mechanical structure, hardware, firmware and software have been thoughtfully designed to deliver the highest level of imaging technology. Leveraging industrial design, electrical, firmware and optical engineering yielded a product that generates high quality 8K x 8K, 360º stereoscopic VR video at 30 frames per second, or 5.8K x 5.8K, 360º stereoscopic VR video at 60 frames per second. YI HALO is the most versatile 360-degree capture solution allowing demanding creators to shoot easier, longer and from anywhere. It has a 100-minute battery life, pulling only 50 watts, but also works with AC and alternative power sources. It weighs less than seven and a half pounds, including the battery, and is easy to mount and easily portable. It comes with clear, simple Android, WiFi remote controls, previewing and automated Jump stitching. 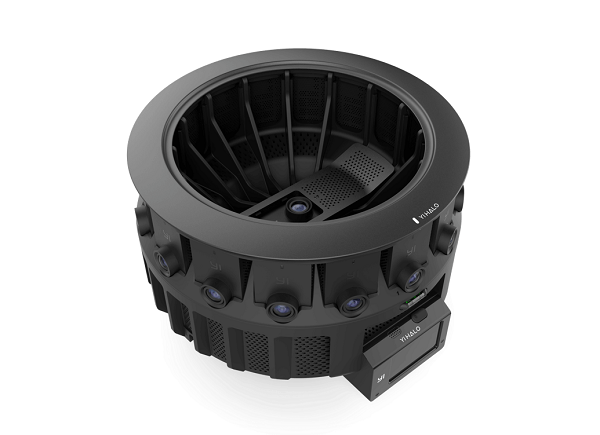 Finally, YI HALO is a complete solution for 360-degree capture; it has been designed and tested to be durable, reliable and future-proof, undergoing over 100,000 hours of stress tests. It features a state-of-the-art, thermal design and a complete built-in screen system for easy control of camera settings and functions. It is a modular camera rig making it easy to upgrade or add new components as they become available in the future. Finally, users will be covered by a customer support package and one-click firmware upgrades based on direct user feedback. The YI HALO virtual reality (VR) camera is now available for pre-orders, priced at $16999.